Unless you are a Tigers or Giants fan, baseball season is sadly over. For my Rockies-and-Mariners-loving-self, the season has been over for nearly a month. It’s always a depressing time. April seems so far away, especially now that I live three states away from the spring training complexes in Peoria, Arizona. So to cheer myself up, I’m reminiscing about my minor league vacation while half-heartedly listening to Game 2 of the World Series on mlb.com. I’d been wanting to go to Tennessee for ages (there was a trip planned four years ago that went awry) to see the Jackson Generals AA baseball team – formerly the West Tennessee Diamond Jaxx. Why the need to see a random team in Tennessee? Because these ball playing fellows are just two steps away from being Seattle Mariners. I’ve followed the Mariners minor leagues for years. I grew up cheering on the Everett Aquasox (the Mariners short season single A team) just north of Seattle. When I moved to Las Vegas, my favorite male travel companion and I would leave Sin City every summer weekend to instead hang out in the crappiest towns of Southern California. We would follow around the High Desert Mavericks (the Mariners long season single A team), cheering for them on in the fabulous cities of Victorville, Lake Elsinore, Bakersfield, and Lancaster. We had to be the only people LEAVING the excitement of Las Vegas to become Victorvillians for the weekend. But hey – baseball calls. We had things timed so Tom could pick me up from school on Friday and we’d pull into Stater Bros. Stadium in Adelanto just as the national anthem was starting. This mad dash unfortunately did not allow for a stop at The Mad Greek in Baker. Anyways, after future Seattle Mariners are finished being Everett Aquasox and High Desert Mavericks, they move onto Tennessee to become Jackson Generals. (There is also a team in Clinton, Iowa, but I haven’t been there yet. Next year!) Therefore when my parents and I planning on visiting family in Baldwin, Wisconsin, I insisted that we “swing by” Jackson, Tennessee on the way back to Colorado. (Note to the geographically challenged: Jackson is NOT between Denver and Baldwin.) Luckily my parents are also diehard minor league fans, so convincing them to take a five-state detour was an easy task. We left Graceland in the afternoon and made the two hour drive to Jackson. I was humming Johnny Cash’s “We’re Going to Jackson,” for most of the drive, despite my mom gently suggesting that the song was most likely referring to the town in Mississippi. Unaffected, I sang on. My favorite part about driving through the south is singing all the country songs that are affiliated with various cities. I’ve made more than one travel companion despise the songs “Maybe it was Memphis” and “I’m a Little Past Little Rock (but a Long Way from Over You)” over the years. Come to think of it, that is probably why Tom killed the trip to Tennessee all those years ago. Back to baseball: The Jackson Generals play in Pringles Park, right off of I-40 (you can see the park from the freeway). Being in Tennessee, the place was HOT. My mom claimed that she’d requested seats in the shade, but we were seated squarely in the sunshine. If you go to a game around 4:00, you’re going to want to sit in sections G – I in rows 15-22. Later in the evening, your back is to the sun if you are on the third base side sections A – F. Luckily, it was not very crowded, and so we abandoned our assigned seats and moved to the shade. 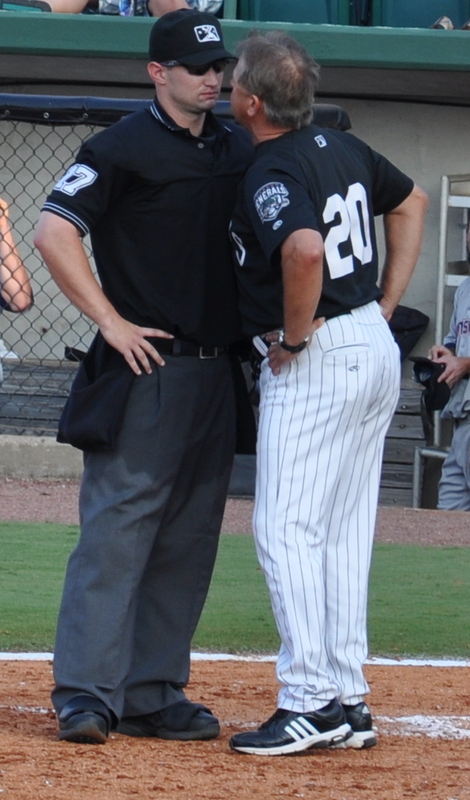 It was a great game, even though the Huntsville Stars beat us in the 11th inning. If you are in the area, catch the game on the radio at 101.5 FM. A few days later my mom and I found ourselves in Little Rock Arkansas for a day longer than expected (The Little Rock Nine Museum was just too cool. We couldn’t tear ourselves away after our allotted one hour had passed). How should we fill up an evening? Baseball, of course! Right across the river from downtown Little Rock is the gorgeous Dickey-Stephens Park, home of the Arkansas Travelers since 2007. While the stadium is relatively new (the gal checking us in at our hotel was reminiscing about watching the Travelers at Ray Winder Field. She rolled her eyes at the mention the “new” stadium), the team is certainly NOT. The Travelers have been around 1895! They are currently affiliated with the Los Angeles Angels. The game was fun, full of typical minor league shenanigans: errors, ground rule doubles and a run scored due to consecutive wild pitches. It was apparently “paramedic night” at the ball park – the men in white made three trips to the field, the first incident involving a little leaguer who passed out during the national anthem (it WAS pretty hot). Luckily everyone made it through the nine innings without having to be transferred to the hospital. My mom and I were especially glad to have had a fulfilling night of baseball when we returned to our hotel room to find that back in Seattle Ichiro had been traded to the damn Yankees. It’s a good thing I like farm teams, because that’s basically what my Mariners are – a farm team for the Yankees. Luckily this World Series game that I’m listening to right now does NOT involve the soul-sucking/money grabbing team that gets booed by their own fans in New York. Listening to Detroit shut them down a few weeks ago was glorious. Things aren’t looking so good for Detroit now, but its baseball…you never know what could happen. Maybe the Mariners will even make it to the play-offs someday. Elvis was hot. I don’t know why I’m so late to pick up on this fact, but he really was. Way cuter than any of the Beatles, I think. Obviously I’m talking about young and relatively skinny Elvis, aka the only Elvis discussed and displayed at Graceland. 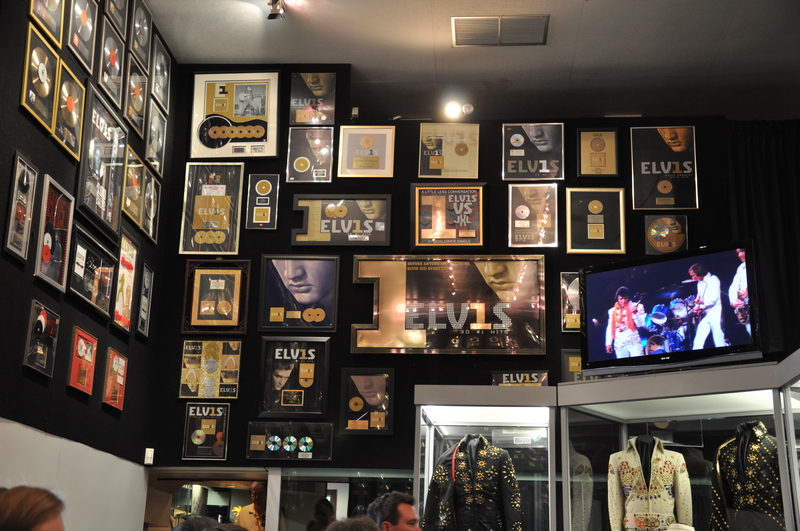 I’m not a huge Elvis fan, but was adamant that we had to go to Graceland while in Memphis. I feel like quite the dork because the Graceland references that I could conjure up involved that TV show Full House. Remember how Uncle Jesse was a huge Elvis fan? Anyways…the audio tour through the Graceland mansion and grounds was pricey ($32 for the cheap tour plus $10 to park), but fun and worth it. I am generally pro-audio tour, and this was an especially good one due to the obvious plethora of music that accompanied the tour. 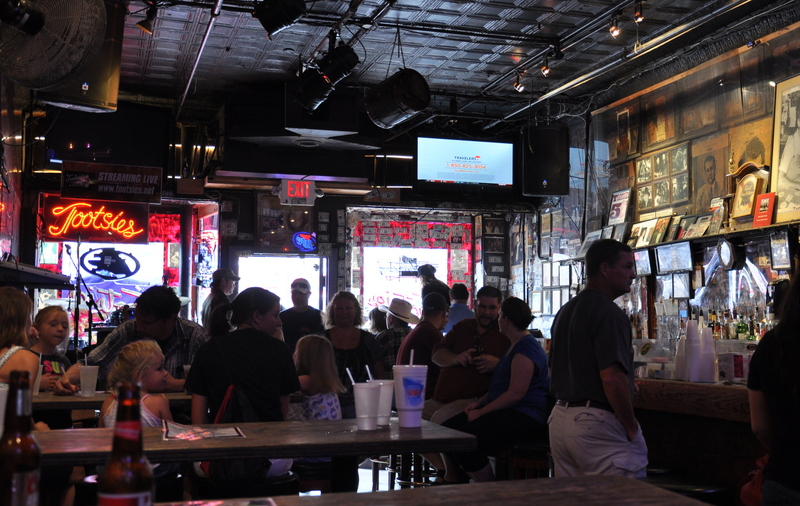 Graceland tickets can be purchased ahead of time online here or at Graceland. Since we were due to be in Memphis on a Saturday, we got tickets online. We avoided a short line, but would have been fine either way. They do offer AAA discounts, so take advantage if you are a member. After buying tickets you can visit the MULTIPLE gift shops (it’s kinda like an Elvis strip mall around there, complete with an ice cream shop) before receiving your audio headset and hopping in the bus line. 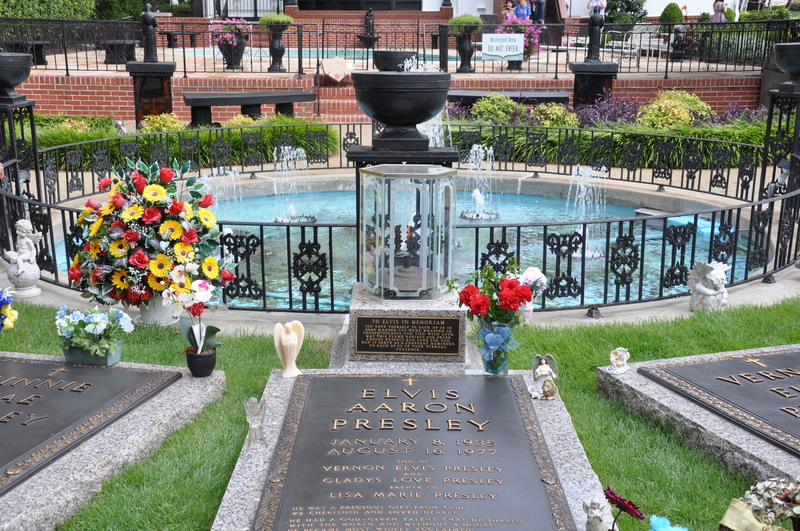 A very short (like, two minutes) air conditioned bus trip takes you across the street to Graceland. 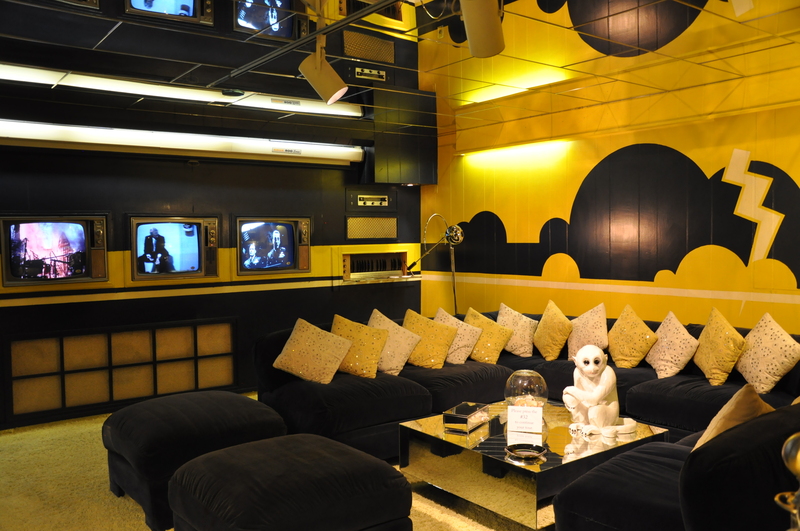 While small by today’s mansion standards, Graceland is a cool place. 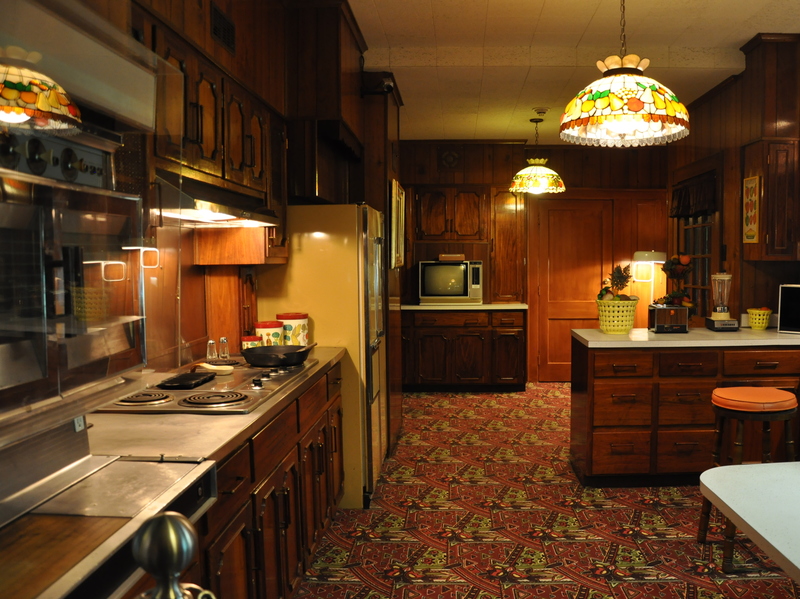 Elvis did not design or name the place, but bought it pre-built and kept the name Graceland. Like every poor kid, Elvis had promised his parents that he would someday provide for them, and indeed they always had a room in Graceland. Non-flash photograph is allowed (Obviously. I’m too scared to take illegal pictures), but visiting the upstairs private part of Graceland is not. 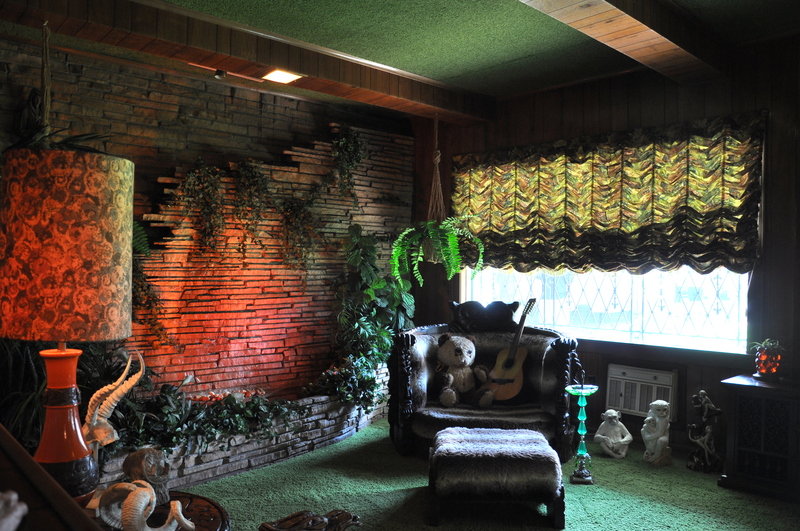 The tour takes you through the living room, Elvis’s parent’s room, the carpeted kitchen and the jungle room (also carpeted…on the ceiling) before heading downstairs and outside. The buildings surrounding the mansion contain tributes to his fame and musical career. There are videos of him talking about his deployment overseas (can you even image pop stars being in the service today?) and scenes from his movies and concerts. 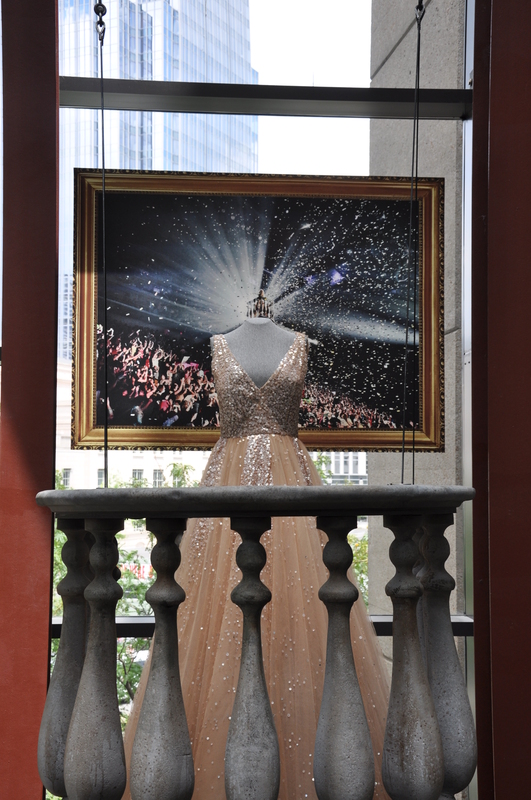 Some of his be-spectacled pantsuits are on display, surrounded by albums and awards. 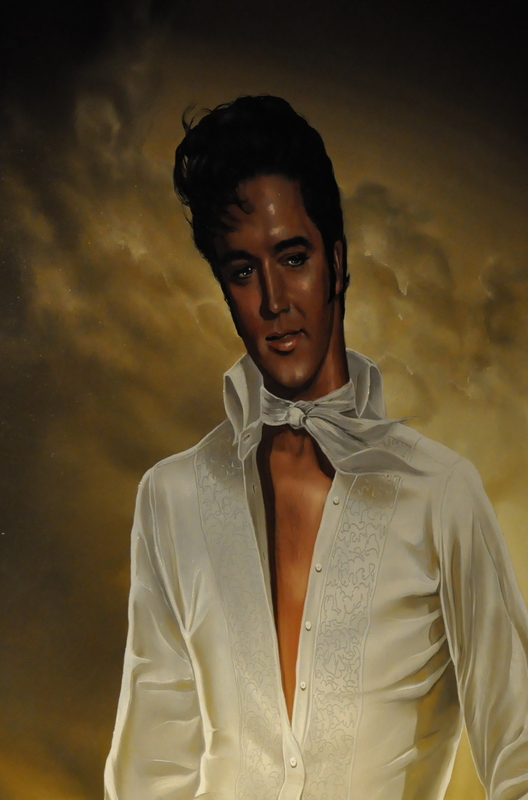 You can trace a timeline of his life and career through the displays and audio tour information, but there is NO mention of any negative aspects of Elvis’s life, although drugs were briefly mentioned when discussing Elvis’s untimely death. Outside the mansion the tour takes Graceland visitors past Elvis’s gravestone, where fans still bring a barrage of gifts and flowers. 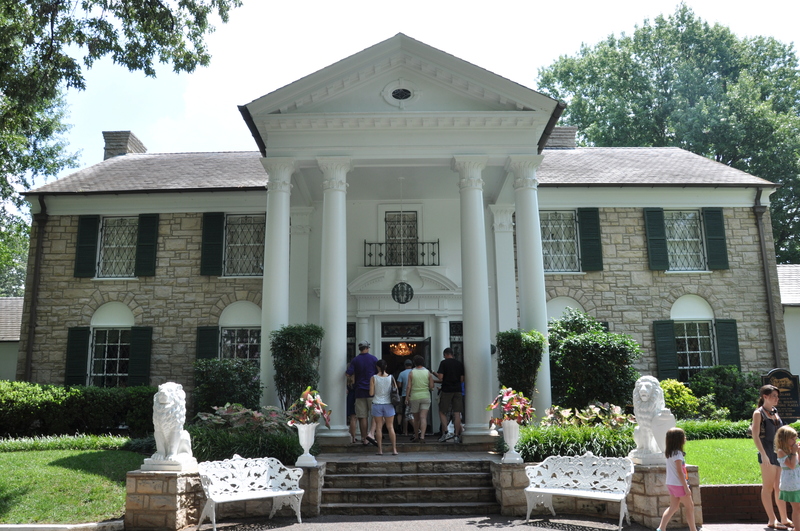 The tour takes a little over two hours, although you are welcome to spend as much time as you’d like in Graceland. It was crowded, but people were never pushing you to move along or speed up. There was not a line visitors had to stay in. The audio tour had several sections wherein you could stay and hear optional information, so I would image that hard-core Elvis aficionados would probably stay longer than two hours. After the tour a bus takes you back across the street so you can purchase Elvis souvenirs – pink Cadillac earring, anyone?